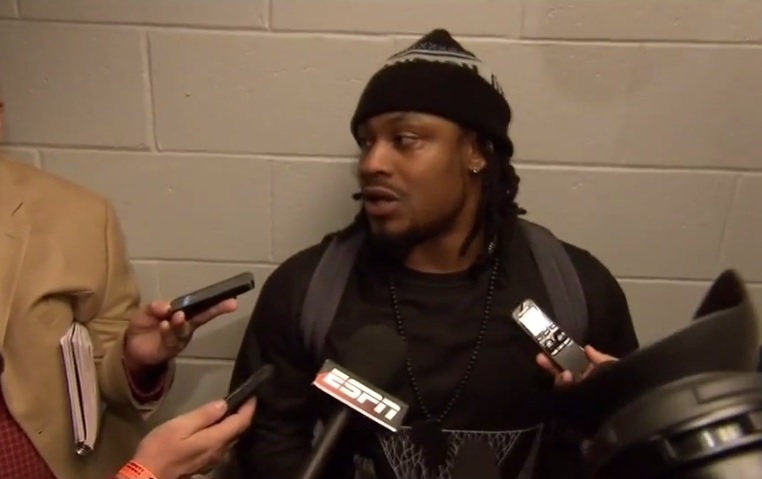 Marshawn Lynch’s responses aren’t as rare as you might think. 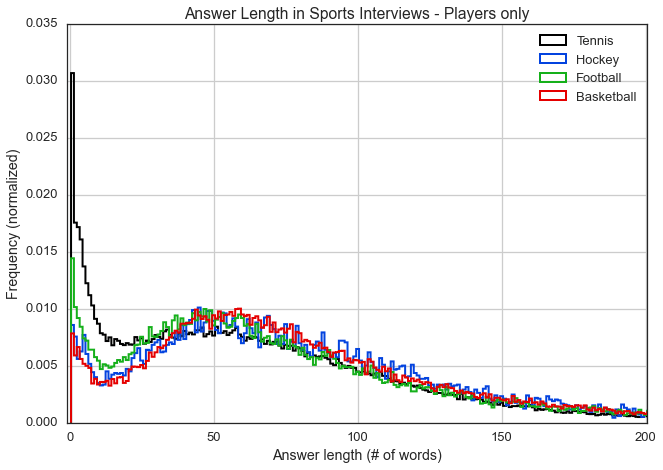 Over the past month, my colleague Adam Gilfix has put together great analyses of sports interviews and some of the phrases that have become standard in interview questions, like “talk about…” and “how big was…”. With the great interview dataset from ASAP Sports at hand, I started thinking about a different set of questions: how much do the coaches and players say in interviews, and what are the most common responses? 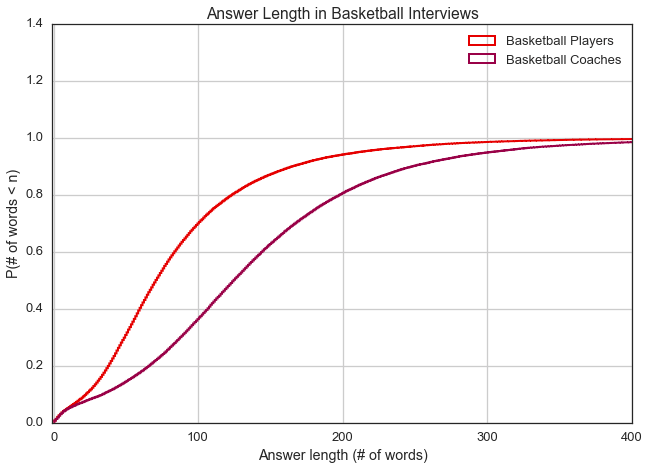 The probability of having a response of less than 100 words is close to 80% in a tennis interview, but hovers closer to 60% for football, baseball, and basketball. This shows more clearly a trend that the first figure hinted at. It seems, from these data, that tennis players tend to be terser in their interviews than their colleagues in other sports. At the same time, basketball responses tend to run longer than the other sports. One difference we haven’t accounted for so far in this analysis is the fact that the interview dataset is a mixture of interviews with players and coaches. For all the sports except baseball, interviewees who are coaches are labeled with “Coach” in their names*, so we can exclude the coaches from the dataset and look at player responses only. The only wrinkle here is that the ASAP Sports dataset does not distinguish baseball managers from players, so we’ll exclude baseball from the next part of the analysis. For the remaining sports, the difference in composition is clear. Basketball, hockey, and football have responses from coaches in 45%, 35%, and 62% of the questions, respectively. In tennis, only 0.1% of the responses are given by someone with “Coach” in their name. Is it possible that the difference between tennis and the other sports is coming solely from the composition of players vs. coaches? 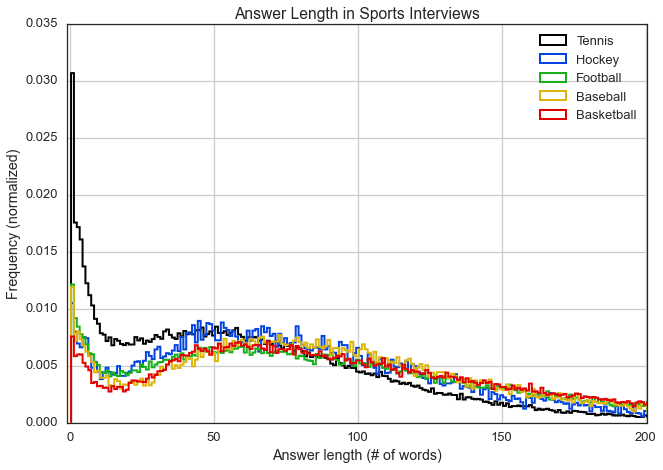 Hockey, football, and basketball interviews now have probabilities of approximately 70% for having a response of less than 100 words (with football a bit higher than the other two). Comparing to the ~60% probability we saw for these sports before, it seems that the coaches did account for some, but not all, of the difference between tennis and the other sports. The difference here is remarkable! Only 38% of coach responses have less than 100 words in them, while 70% of player responses have less than 100 words. I guess even with coaches like Gregg Popovich, who is notorious for not answering silly questions in interviews, coaches in basketball tend to be much more talkative than their players. What is most striking in this list is that of the top 15 most common responses, the overwhelming majority of them are positive (yeah, yes, etc.). This, to me, indicates that reporters are likely often asking players and coaches questions where the answers are already clear! (Of course, one-word answers only account for a few percent of all responses, but the proportion of those one-word answers that is positive is quite remarkable). Somewhat unsurprisingly, “thank you” ranks at the top**. The rest of the top 15 are a mixture of positive, negative, and confused responses, but the positive bias is definitely still there. Overall, I think this dataset has shown us that players and coaches are actually more talkative in interviews than we realize. 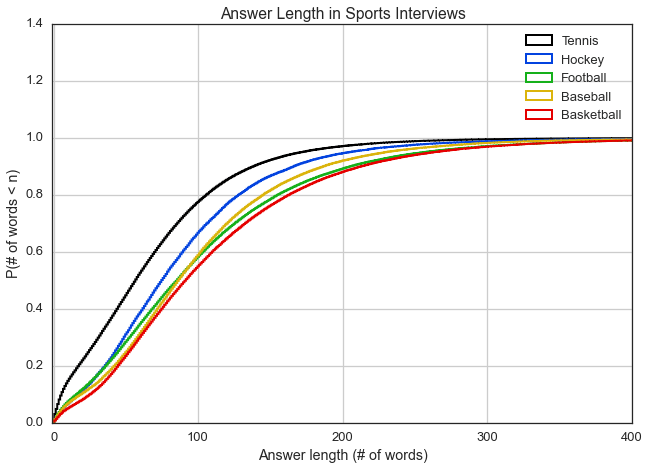 Even though there is a fair proportion of short (<10 word) answers, if we can ask the right questions we see that often there are detailed responses waiting, especially from coaches. * It’s possible that there are interviewees in the other sports as well who are coaches but not labeled as “Coach” in their name. These instances would be counted with the players but are likely a small fraction of the dataset. ** The number of instances of “thank you” is actually even larger than the number I am reporting here, because some of such responses were removed from the dataset during scraping.